For some reason, I’ve decided to go through my log of the books I’ve read and start adding a bit more information for each entry. Right now, I’ve been adding binary categories for gender and queerness, and more detailed fields for national identity / ethnicity, original language, year published, and genre. *Epic refers to national epics, like the Epic of Gilgamesh, not epic fantasy. **Broke out paranormal romance as a different category from speculative fiction, because it feels like most people treat it as a different genre. In creating this list, I was most concerned with genre categories as they’d be in the book store, not with the normal science fiction fan’s game of recategorizing various classics and works of literary fiction as being genre novels. So, for instance, I counted The Handmaid’s Tale as a novel. 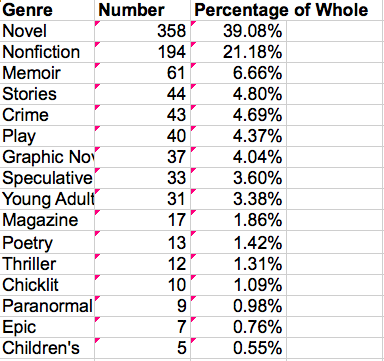 The only major surprise here, for me, is the number of nonfiction books that I’ve read. I would not have thought that one in five of my books would be nonfiction. SO much reading! So impressive.